Does your site provide reviews from critics? Use critic review structured data. Embed a review into another schema.org type using its review property. Add ratings to your reviews. Add aggregate ratings. You can omit the rating for an individual review if your marked-up content contains both an author and a review date. For aggregate reviews, you must supply the average rating for the rich snippet to display. Make sure to mark up an aggregate evaluation of an item by many people with schema.org/AggregateRating. Google may display aggregate ratings as rich snippets or, for certain types of items, answers in search results. 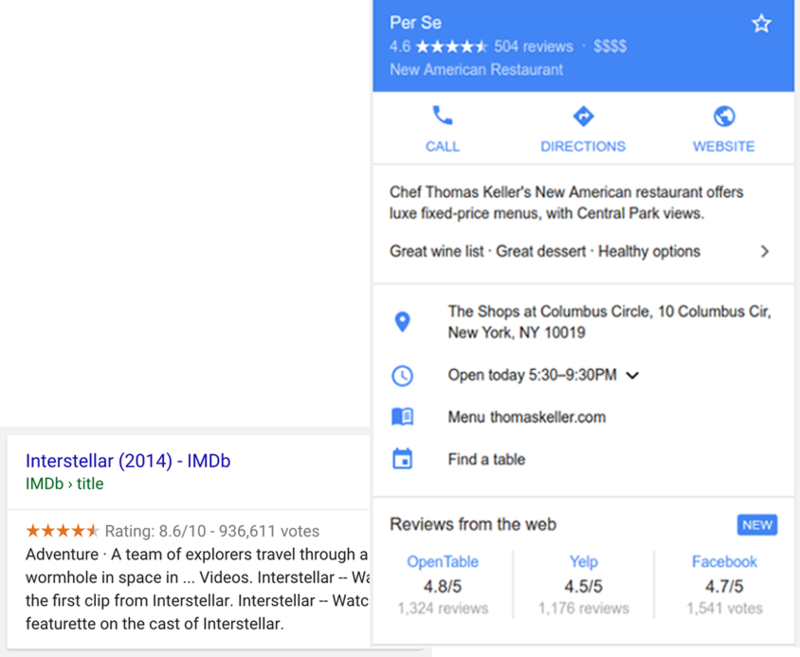 Don't rely on human editors to create, curate, or compile ratings information for local businesses; instead, use critic review structured data. You must include the required properties for your structured data to display in search results. You can also include the recommended properties to add more information to your structured data, which could provide a better user experience. The item that is being reviewed. This needs to be a valid schema.org type. However, if the review is embedded into another schema.org type using the review property, you can omit the itemReviewed property. The rating given in this review. The rating can be a nested Rating or more specific subtype. The most typical subtype is AggregateRating. A numerical quality rating for the item, either a number, fraction, or percentage. (for example, "4", "60%", or "6 / 10"). If the scale is not implicit (for example, "4") a 1 to 5 scale is assumed. If another scale is intended, use bestRating and worstRating. The date that the review was published, in ISO 8601 date format. The highest value allowed in this rating system. The bestRating property is only required if the rating system is not on a 5-point scale. If bestRating is omitted, 5 is assumed. The lowest value allowed in this rating system. The worstRating property is only required if the rating system is not on a 5-point scale. If worstRating is omitted, 1 is assumed. The full definition of AggregateRating is available at schema.org/AggregateRating. The item that is being rated. This needs to be a valid schema.org type. However, if the aggregate rating is embedded into another schema.org type, using aggregateRating property, then there is no need to mark up the itemReviewed property. The total number of ratings for the item on your site. At least one of ratingCount or reviewCount is required. Specifies the number of people who provided a review with or without an accompanying rating. At least one of ratingCount or reviewCount is required. The highest value allowed in this rating system. The bestRating property is only required if the rating system is not a 5-point scale. If bestRating is omitted, 5 is assumed. The lowest value allowed in this rating system. The worstRating property is only required if the rating system is not a 5-point scale. If worstRating is omitted, 1 is assumed.